Bluebirds are some of the most sought-after backyard birds. Backyard birders who know how to attract bluebirds by meeting the birds' exact needs can enjoy the benefits of these colorful, charismatic thrushes throughout the year. All three North American bluebirds – eastern bluebirds, western bluebirds and mountain bluebirds – are small thrushes, songbirds related to the American robin, varied thrush, and gray catbird. While all three bluebird species are migratory, large portions of their range are occupied year-round, and many backyard birders are able to attract bluebirds in every season. All bluebird species have stunning plumage with rich blue backs and rusty or pale underparts, and those colors alone make them desirable for a beautiful backyard. Their insectivorous diets also make these birds welcome guests because they readily eat large numbers of insects, moths, and larvae and provide superior natural pest control. Their trilling, warbling song is another great reason to attract bluebirds, and successful backyard birders enjoy bluebirds' serenades throughout the summer breeding season. The key to attracting bluebirds is to meet these birds' specialized and sometimes finicky needs for food, water, shelter, and nesting sites. Food: Bluebirds have a varied diet and eat different foods in different seasons. Bluebirds consume a wide variety of insects, particularly during the nesting season when hatchlings need abundant protein for adequate growth. Avoiding insecticide use is critical for giving these birds a healthy food source. Backyard birders can also augment the natural insect supply with mealworms in ground, tray, or platform feeders. Bluebirds will also eat a wide variety of berries, such as sumac, holly, and elderberry. Adding these berry-producing shrubs to the yard will help create a bluebird-friendly landscape. Suet offered as crumbles or shreds can also be valuable for attracting bluebirds, particularly with insect or fruit blends. Water: Bluebirds require fresh, clean water for drinking and bathing, and a low, wide basin with 1-2 inches of water is ideal for these thrushes. Moving water with a bubbler or fountain will attract their attention more quickly with splashing noises and glittering sparkles. Choose a birdbath design large enough to accommodate family flocks that may have a dozen birds all vying for a drink. In the northern and winter areas of these birds' range, a heated birdbath is essential to provide liquid water during freezing weather. Shelter: Bluebirds typically prefer mature, widely spaced trees, and they are less likely to visit a backyard with dense, thicket-like areas of foliage. Preserve just a few mature trees and opt for low ground cover surrounding broad, open, grassy areas to provide these ground-feeding birds security while foraging. Berry bushes that are a good food source are an excellent choice for plants that will do double-duty as both food and shelter. In winter, supplement bluebirds' shelter with medium or large roosting boxes to provide protection from storms and freezing temperatures, or leave hollow snags intact for roosting birds. Nesting Sites: Bluebirds are cavity-nesting birds, and they regularly nest in wooden birdhouses of the appropriate dimensions. Houses should ideally be placed 4-7 feet above the ground in open areas, with the entrance facing away from prevailing winds. Offering nesting materials such as pine needles and cotton scraps may attract bluebirds' attention to the houses. Monitor bluebird houses to discourage house sparrows and European starlings that may usurp the nesting spots and could harm bluebirds. Clean birdhouses after each brood leave to encourage additional nests. Even after you've taken steps to meet bluebirds' basic needs, it can take time to attract them to your yard. Some tactics, however, can help you have even more success and encourage bluebirds to visit. Be prepared for bluebirds year round, including early spring and late fall to accommodate migrating birds or the movements of juvenile bluebirds. Keep open grassy areas of the lawn trim and neat to allow bluebirds to access insects and feed more easily. Discourage feral cats and keeping pet cats indoors to eliminate that threat to bluebirds and other wild birds. 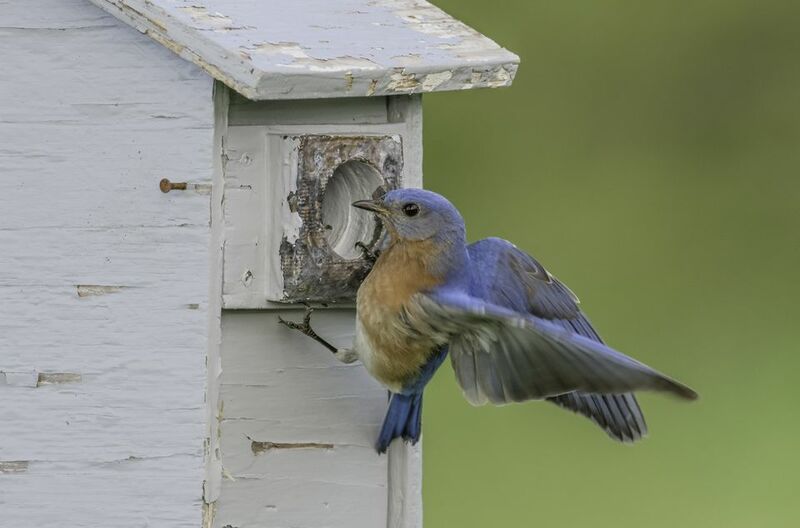 Take steps to protect birdhouses from predators so brooding bluebirds and vulnerable chicks are safe. Provide low (3-4 feet high) perches such as old fence posts or wire fences for bluebirds to forage from. Above all, patience is required when learning how to attract bluebirds. Different bluebird populations may be used to different habitats and feeders from other backyard birders, but once they become accustomed to your efforts they will be loyal visitors for many happy years.